Hello, my name is Jim Sells, the developer of several multimedia programs for Windows. Let me tell you why you should try our latest creation, TVactive. First, let’s mention VCRadio, our program that controls computer FM radio tuners with a built-in audio recorder and versatile programmable timer. While using my computer for several hours each day, I found this program surprisingly useful for capturing and playing background music and news shows during my intense programming sessions. I recommend it. Until recently, real-time video recording on the desktop was impractical for most users. However, large fast inexpensive disk drives, fast (>450MHz)CPUs, and improved real-time video codecs now make video recording practical for personal use. With Microsoft’s WindowsMedia video codec at 256kbs, a one-hour program takes less than 200 MegaBytes, and the result has adequate(albeit a little grainy) video quality for many purposes, and you can adjust the recording bit rates up or down for your own viewing preferences. With our experience developing VCRadio, we wanted to turn our attention to creating the ultimate TV tuner control program. It would have built-in timers like a VCR, except infinitely easier to program. It would have built-in recording controls. It would remember your favorite TV stations and their call-letters. It would look cool on your desktop, or hide conveniently on your taskbar tray. It would keep an archive of your broadcast recordings. And, since I would use it every day, it would work well, and keep getting improvements in future versions. Well, here is the result. I think you’ll like it. The main TV window is uncluttered, but shows all necessary controls. Nearly all controls have keyboard short-cuts, for laptop users.Heavy-duty channel surfers take note: PgUp and PgDn keys can be used to change channels. The main window can be used to display and navigate video files, or you can use Media Player, etc. If you wish, the main window can be configured tocollapse when video is not being displayed, saving screenreal-estate. In the Station dialog, you can specify a name for aparticular tv station. Don’t you wish your TV/VCR could do that? Now let’s program a timed recording event. Don’t worry,this is much easier than programming your VCR!! Bring up the Timer dialog. Click on New Event, and let’s enter the information to program a favorite scheduled broadcast. You may specify how many recordings to keep for a particular event.If you don’t get around to viewing and deleting a particular program,it won’t have to keep filling up your hard drive. Events don’t only have to be for video recording. Sometimes it is useful for the TV (or audio) to turn on at a particular time, even if you are not interested in recording. Event actions that you can program include Record TV, Record Audio, TV On, and Audio On. Now, after the recording is finished, we can find it in the Archive dialog, and play it back. 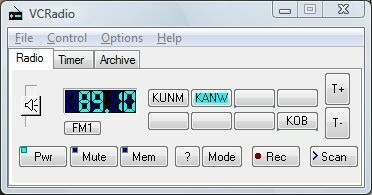 Some computer TV tuner devices also include anFM radio tuner. For several of these tuners, TVactive and VCRadio can share the same device. When TVactive turns on, VCRadio automatically turns off, and vice versa!